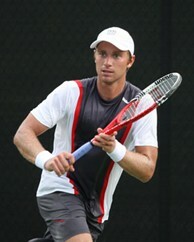 Ruben Bemelmans became the first to qualify for the singles main draw as he eased to a comfortable 6-2, 6-2 win over Ricardo Hocevar. Bemelmans jumped out to an early lead, using a powerful service game to put Hocevar on the back foot. Despite only securing 2 of 8 break points, qualifying’s top seed, Bemelman, managed to take the set. Bemelmans’ serve dominance won him 84 percent of his total service points in the first set. In taking the second set, Bemelmans relied less on his serve and more on taking the opportunities he so frequently squandered in the first. The Belgian went 2 of 2 on break points in the second set to put away Hocevar and book his place in the first round of the main draw. Third seed Sergei Bubka followed Bemelmans in earning a spot in the main draw as he brushed aside Tim Symczek of the USA in straight sets. The first set proved a back and forth battle with Bubka holding the momentum for large stretches without being able to clinch the crucial point. Despite Smyczek saving four break points, Bubka scored the crucial break and went on to win the set 6-3. As with Bemelmans, it was a case of taking the opportunity when it presented itself for Bubka who managed to save the only break point he faced before breaking his American opponent and booking his place in the main draw. Bubka closed out the straight sets victory 6-3, 6-4. Ricardas Berankis continued the procession of qualifying’s top seeds into the main draw with a thrilling three set victory over Rik De Voest. For the second straight day, De Voest played in a three set match that featured two tiebreaks. For the South African, De Voest, it was a reversal of his third round win over Kevin King on Sunday. De Voest took the first set from his higher seeded opponent, winning the tiebreak 7-4. Berankis caused plenty of his own problems in the first set as he committed five double faults and only registered 41 percent on his first serve. The Lithuanian continued to struggle with his serve in the second set, committing eight more double faults. However, De Voest wasn’t able to take advantage of the mistakes made by his opponent as he failed to convert three match points before Berankis came back to win the tiebreak 7-6(5). After the drama of the first two sets, the deciding one proved relatively anticlimactic. Behind a much improved service game and no double faults, Berankis eased into the main draw, breaking De Voest twice and finishing the match with a 6-7(4), 7-6(5), 6-3 win. 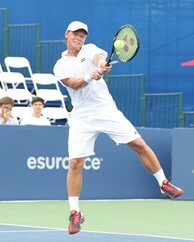 The final man to qualify for the main singles draw was the USA’s Alex Kuznetsov. The match was the first time in the tournament that either Kuznetsov or his opponent, Ricardo Mello of Brazil, played a third set having won their previous matches in straight sets. It was the American however who managed to adapt the best. Kuznestov dominated the first set in which he broke Mello four times on only six break point opportunities but the Brazilian fought back to save four match points and level the match at one set all in the second. Kuznetsov eventually secured the crucial break in the deciding set, winning 6-1, 3-6, 6-4 in the third.